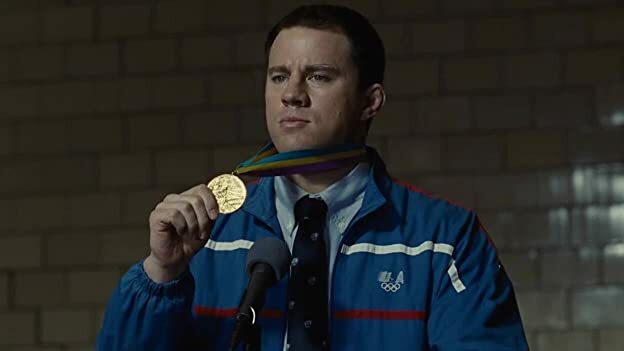 FOXCATCHER is a film that is easier to admire than to love, and I mean that in the best way possible. While the slow and deliberate pacing will put a lot of people off, its disturbing subject matter, psychological depth and outstanding performances make it fascinating, if not riveting. For those unaware of what the story is about (like I was), the film mostly revolves around Mark and David Schultz, two Olympic gold medal-winning wrestlers who become involved with eccentric millionaire (billionaire?) John Du Pont, specifically in preparation for the 1988 World Championship and Seoul Olympics. But wrestling is just the conduit for a deep character study of people who looked to overcome personal weakness by achieving greatness. It's really hard to say who gives the best performance out of the three leads because all of them do so well. Mark Ruffalo (who plays Dave Schultz) usually does well, and this is no exception. Steve Carell was barely recognizable as the eccentric Du Pont, greatly aided by prosthetics in his physical transformation, but also quite different in the way he spoke and carried himself compared with what roles he usually plays. I suppose the biggest surprise of them all is Channing Tatum (playing Mark Schultz) who manages to hold his own against these other two acting greats. Although he didn't have a whole lot of dialogue (and really, the film as a whole doesn't), the physicality he brought to the role was incredible in its own right. As for the wrestling scenes, they were shot well, if unspectacular. Basically they did what they needed to do for the narrative, i.e., serve as guideposts so that one didn't get lost in the pacing (and also because they were factual). What interested me the most, though, was the curious relationship that develops between John Du Pont and Mark Schultz. Du Pont takes Mark under his wing, provides him with living quarters, a training facility, and pays him, yet his status as the team coach (and quite a rich one at that) makes it where the relationship is rather one-sided. In real life, John Du Pont was the black sheep of his family and a very lonely man, and taking on Mark Schultz was a way for him to indulge in his interests and to have a friend. Now, as interesting as I find true crime, there usually has to be some stylistic choice or a scene or two which get to me in an emotional way, and this film has that as well. Both of these scenes are dialogue-free and are scored using Arvo Part's "Fur Alina," a hauntingly minimal piano piece which I recently discovered. To me, these scenes (which I won't spoil) perfectly capture the film's melancholy tone. And in general, the score is rather tasteful. Often, the sound design will completely take a back seat and certain scenes will play out free of dialogue with a sort of humming that brings a subtle intensity and a growing sense of dread. 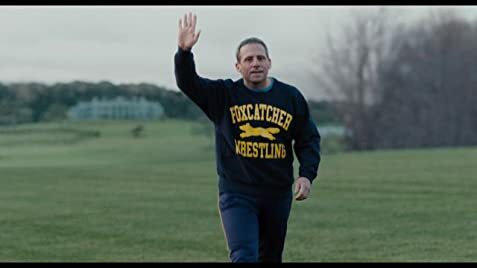 Overall, FOXCATCHER is an excellent, dark character study that features some great performances and an ending that will shock you even if you see it coming. Highly recommended, as long you have a good attention span.